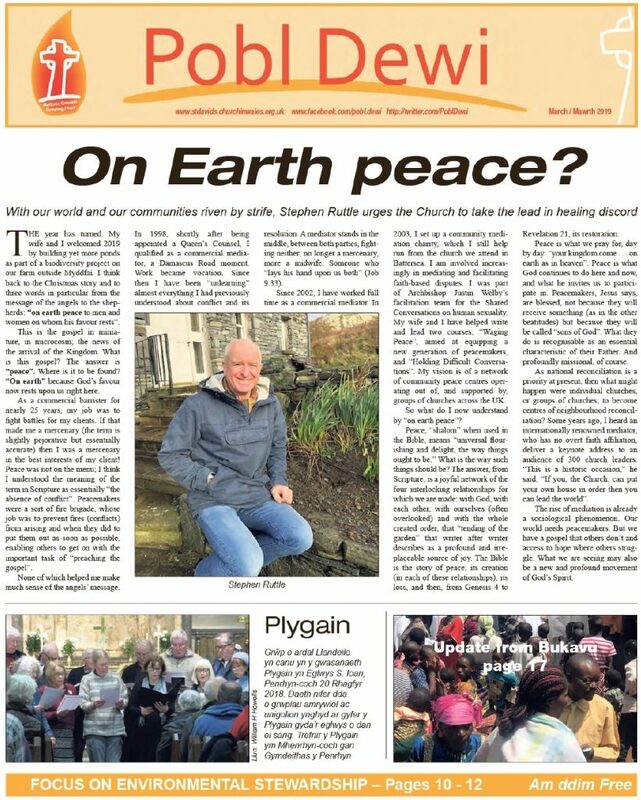 Pobl Dewi (David’s People) is our diocesan newspaper, published four times a year. You can download the current edition and also look back into the archive. To be a shop window for the diocese. There is an editorial team which consists of members of the Diocesan Communications Team. The editor reserves the right to edit all material submitted. Good quality photographs are always welcome. Contributions to Pobl Dewi are always welcome in the form of stories up to 400 words long – preferably complete with pictures – or simply tip-offs about significant events and personalities. Please note: We are no longer able to accept hard copies of articles/photographs. ...a thoroughly excellent edition, covering not only the ecological crisis and so many other important issues. It is remarkable what a high quality publication this is. It seems that some churches are not receiving their copies of Pobl Dewi in a timely fashion. This is undoubtedly due to a wide variety of reasons but copies of the paper should be in every church across our diocese by the middle of the months of March, June, September and December, annually. The delivery system, as it currently stands, is that copies are delivered to Area Deans for distribution around their patch but we do know that some have an enormous area to cover and that this, added to their other duties, may prove to be an onerous task. We would be very happy to help sort out any issues of non-delivery. For example, we could arrange for a minimum of 50 copies to be delivered to one person for a few churches in a group, or we could arrange for half of one LMAs/deanery’s copies to be delivered to one place and half to another. A variety of options is available but unless we are told where the problems exist we cannot know, nor help. If this applies to you, in any church, large or small, please do get in touch with our Diocesan Communications Officer, David Hammond-Williams or the Editor, Tessa Briggs and, working with you, we will endeavour to ensure that you receive Pobl Dewi regularly and on time.